It looked like it might get rough for a while there. Our beloved former Duck Marcus Mariota got off to a less than perfect start in his debut with the Tennessee Titans, throwing an interception and having a fumble returned for a touchdown on the two first possessions of his NFL career in a preseason matchup with the Atlanta Falcons. Marcus Mariota has been great during training camp for the Titans despite a shaky start to his NFL debut. Leading up to the exhibition, Mariota had been exceeding expectations – one of the biggest storylines of Titan training camp was Mariota’s composure and accuracy. Eight-year veteran backup Charlie Whitehurst told USA Today Sports, “His poise is unlike most rookie quarterbacks I’ve seen.” Head coach Ken Whisenhunt also raved about the young QB’s maturity. He had yet to throw an interception in practice after roughly 186 attempts, according to an interview with ESPN’s Ed Werder. That changed awfully quick Saturday. Atlanta’s Justin Durant intercepted a screen pass from Mariota at 6:34 in the first quarter, which set up a field goal for Atlanta. On the ensuing Titans possession, Mariota had the ball stripped from him and returned for a Falcons touchdown. Needless to say, the man who had enjoyed so much success at Oregon was not overly pleased. Mariota showed flashes of his potential in his first NFL action. But, in typical fashion, Mariota responded to these mistakes with an impressive 90-yard touchdown drive, going 5-5 on the drive. The rookie quarterback finished the game with a solid overall effort, going 7-for-8 with 93 yards. 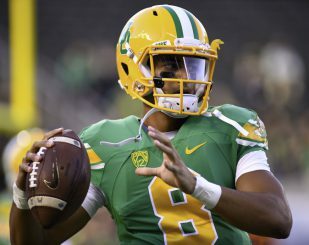 This was the Mariota that Duck fans came to know during his time in Eugene. I fully expect Mariota to have both ups and downs this season with the Titans, a 2-14 team in 2014. However, as the Oregon faithful already know, this kid is special in terms of on-field ability and off-the-field temperament. And as the Titans add more and more talent around Mariota, he could elevate them to heights they haven’t known since the early 2000s. With Marcus Mariota gone, is Jeff Lockie next in line? 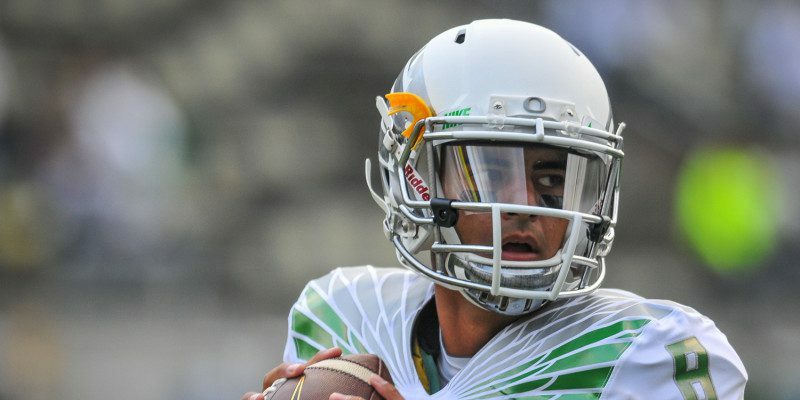 While the future looks bright for Tennessee’s young signal-caller, there is no questioning the fact that Mariota’s departure from Oregon to the NFL has left a significant void at the quarterback position for the Ducks. With Vernon Adams officially joining the Ducks at practice last week, the battle for Mariota’s heir apparent is officially on. Jeff Lockie brings experience with the system and proven leadership this offseason, while Adams brings the excitement, raw talent and more playing experience. Buckle up folks; this ought to be a good one. I’m sure Marcus will be watching.